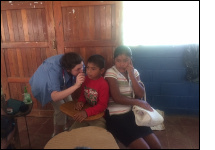 In January, I joined 2 faculty and several of my resident peers on a service trip to the RAAN Nicaragua. I am grateful for the opportunity and the support the Josephson Fund provided me. During the course of our trip my group evaluated over 600 patients in clinic. In addition to the clinical experience I gained. I would be re-missed if I didn't reflect on the people I met and the kindness and generosity that was extended to me. When I returned back to the US - to my regular job and my regular clinic schedule, I felt re-energized and refreshed. My trip reminded me of the reasons why I entered medicine and why working in an under served community is so important - how sometimes even the smallest gestures can make a big impact. -Using a doppler ultrasound to allow a pregnant patient to hear fetal heart tones for the first time. -Dressing leg wounds on a patient who had walked miles to be evaluated. -Seeing the hope and love in the young mothers who came in requesting their children be screened for anemia. The world is large and there is so much to see and so many people to meet. I am grateful to have seen a new place. There is so much beauty on the farms and in the hearts of the people of Nicaragua. But, the world is also small and many of the problems I see in my clinic in Lawrence, Massachusetts are also present in the RAAN. Diabetes, hypertension, and teen pregnancy are great problems. I hope my counseling, prescriptions, and advice can make a difference in both places.